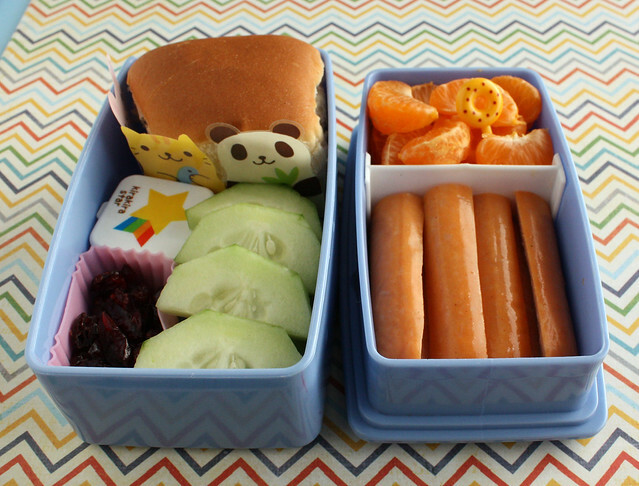 Here are last week’s lunches, just a few days late…. 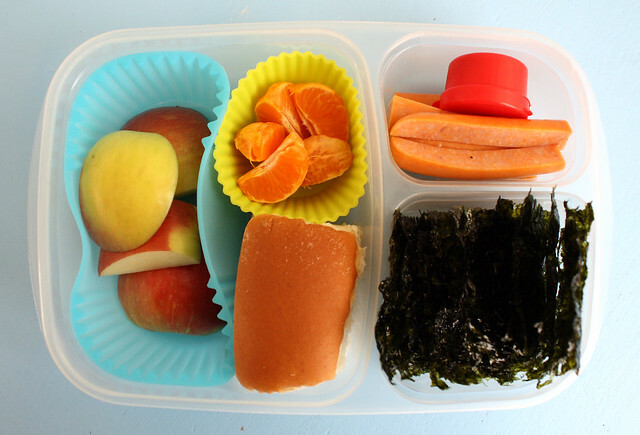 Monday I dug out a bunch of my mis-matched and unused bento goodies that have patiently been waiting for me to put them in a box so Augie’s lunch was a bit of a hodge-podge. He had a dinner roll, surrounded by an animal food divider to keep it from getting damp, cucumbers, hummus in the rainbow box and a few dried cranberries in a tiny silicone cup. The other side had mandarin orange wedges with a donut pick and a hot dog cut in half length-wise and then into quarters. Wyatt’s lunch was super simple, per his request: apple chunks, mandarin orange wedges, a dinner roll, hot dog and sea weed sheets from Trader Joes which he suddenly decided he loves. This was packed in our Easy Lunchbox . I used our Lunchbots Trio for Augie’s lunch on Tuesday. 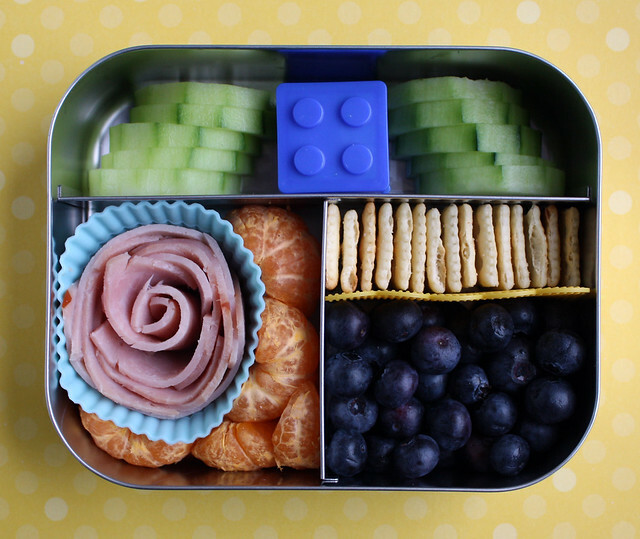 He had cucumber slices with hummus (in the Lego box), a deli ham “rose”, mandarin oranges, mini saltine crackers and blueberries. Wyatt had leftover mashed potatoes with hamburger gravy in the thermos, a box of raisins, an apple and a cheese stick. It was pretty much the opposite of pretty, so I didn’t take a picture. 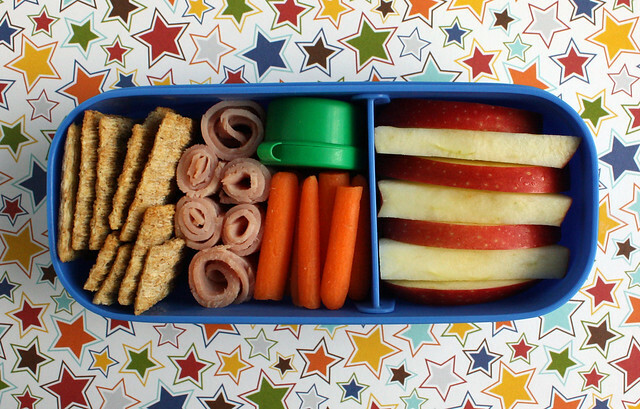 On Wednesday, Augie had Triscuits, deli ham roll-ups, carrots, hummus (in the green box), and sliced apple. Thurday we had turkey dinner! No school Friday, either! Zach took the boys out for burgers. I hope everyone had a super happy and relaxing Thanksgiving!